Studio Fitness | Make your body a nice place to live! Make your body a nice place to live! The amount of misinformation about health, fitness and nutrition, is staggering. Most people don’t have the time, energy or interest to read every study, new fad diet book or blog to know where to even begin. That’s where we come in. All of the trainers at Studio Fitness have years of experience and can truly get you started in the right direction. Call us today and schedule your FREE 45 minute consultation! Studio Fitness offers the gold standard when it comes to strength training, nutrition counseling and physical therapy rehabilitation. Stop wasting time, stop injuring or re-injuring yourself, stop dieting and harming your health. Your life is about to change! Are you ready to start living a better, healthier life? The best way to accomplish your fitness health goals is with help and accountability from those who have the education and experience to motivate you and keep you on target. Personal training is the fast track to improving your fitness! Our nutrition coaches can guide you to address issues including weight loss, diabetes, heart disease and cancer. We offer a 21 day weight loss jump start and metabolism re-set that yields an average weight loss of 5-15 lbs, all while eating REAL food – no fasting, no crazy diets, no fad foods. By deliberately and safely putting clients in an unstable environment using cutting edge balance training technolgies, we effectively strengthen and stabilize the intrinsic stabilizer muscles (tendons, ligaments, etc), which has been shown to significantly improve balance, and prevent injury and falling. Turbo Sonic Sound Vibration Therapy is a tool used to make muscles contract and relax at different frequencies to help eliminate waste that is other wise trapped. It also stimulates fibroblasts, the cells in our bones that if not stimulated usually cause a disease we know as osteoporosis. while taking advantage of everything Studio Fitness offers! Why Do Our Personal Training Client’s Have So Much Success? After working with a personal trainer for 6-8 weeks you will have the knowledge necessary to work out on your own safely and efficiently. Some of our clients have worked out with a trainer for 15 plus years and continue to grow young! Book Your FREE 45 Minute Consultation! Our trainers will help you stay focused, stay motivated, and keep you accountable, so that you can more easily accomplish your goals! At our gym, you’ll see people of all ages, of all fitness levels, and with many different goals. All are welcomed and embraced as part of our community with enthusiasm and support. Most people don’t have the time, energy or interest to read every study, new fad diet book or blog to know where to even begin when it comes to improving their health, fitness, and wellness. That’s where we come in. 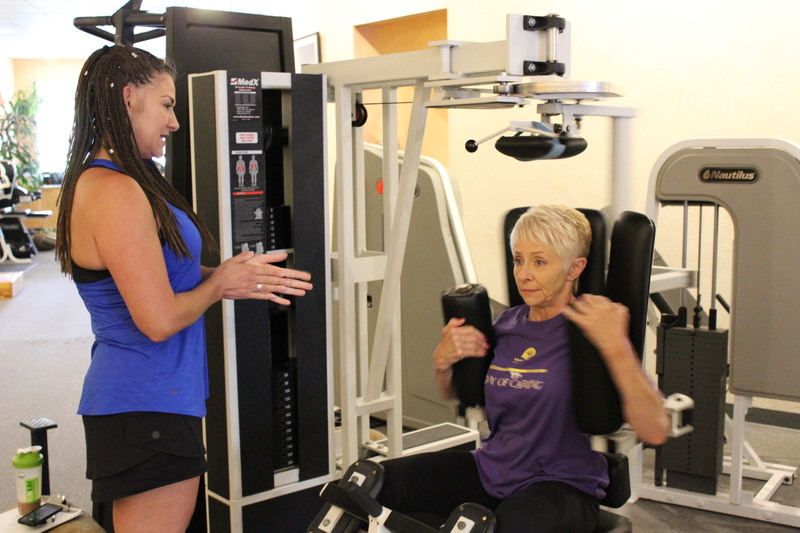 Our personal trainers have experience working with all ages, and with a variety of goals. From weight loss and strength training to balance and mobility. A regular, personalized exercise program along with a healthy nutritional plan can help set a new course for wellness, fitness, and a better quality of life. Most importantly the atmosphere in our gym is unlike any you may have experienced elsewhere, and is something we’ve been doing with love since 1998… we are a family! Please come in and see our little slice of life and get ready to change yours. “Studio Fitness is a wonderful place, with equipment to fit your individual needs. The personnel is warm and friendly. The personal trainers make you feel like family. They are warm and supportive and upbeat, the staff makes you feel at home. My own Personal Trainer, Jennifer Cataldo has literally added years to my life. She keeps me fit and happy. This is especially important for an older person like myself. I am 76 years old and have made a contract with Jennifer to take me to 86 with a sound and strong body.” – J.S. “I have been training at Studio Fitness for the last ten years. The staff is knowledgeable, friendly, and focused on getting results. My trainer has helped me stay in shape through much of my adult life. Studio Fitness has all the equipment needed to improve health and strength, and the atmosphere is comfortable and supportive. I highly recommend this gym!” – T.K. “I’m not a gym rat. I don’t want to start my day in a grunting, egomaniacal meat market. Studio Fitness is my gym-fix: an effective workout in a relaxed space with friendly people, including talented trainers.” – R.H.